Push Notifications. That Actually Work. Without the Hassle of Having to Write Them. People spend an average of five hours a day on their mobile phones. This isn’t news to most churches. In fact, most ministry leaders understand that the church building is no longer the sole ministry hub, but churches need to have a strong mobile presence to continue engaging with their community. That’s why churches use mobile apps to better reach and disciple people. But having a church app alone won’t help you reach more people or get higher attendance at your events. Some of the biggest churches rely heavily on a single feature within church apps to reach more people with their message. Growing churches use push notifications. It’s a highly effective tool to increase community engagement. But not all mobile notifications are alike. Using ineffective mobile notifications or leaning on a poor mobile strategy will not only be ineffective—it could turn people off to your church. That’s why we did the work for you with 211 Ready-to-Send Push Notifications That Will Grow Your Church. It’s designed to help you make mobile notifications a seamless addition to your church’s communications efforts. Ready to engage with more people in your community? 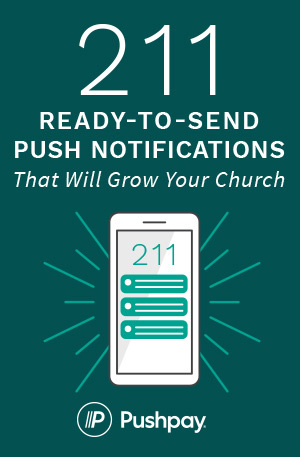 Download the free 211 Ready-to-Send Push Notifications That Will Grow Your Church ebook today.